GEI Works manufactures a line of Argo Water Trailers for Fire Suppression. 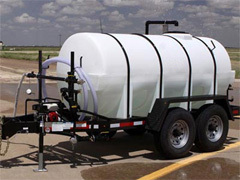 A fire suppression trailer or fire fighting trailer is a transportable DOT-compliant fire water trailer designed to be rugged, durable, and reliable. The fire suppression trailer features a 500-gallon or 1,025-gallon water tank, dual axle trailer, pressure-treated deck, fire hose and nozzle, spray bar, lockable storage box, pump with a Honda engine, D.O.T.-approved brakes, LED brake lights, and full fenders. Additionally, our DOT water trailers are made in the USA and are fully-operational upon delivery. GEI Works' fire suppression trailer can easily be hitched for trailer towing and then transported to any location. Each water trailer can be filled using the pump, filter, and intake screen at a variety of water sources, including lakes and ponds. Towing, pumping, and usage of the fire suppression trailer can be done with just one person, ensuring maximum efficiency in the field. For more information, check out our Argo Water Trailer Product Flyer or visit our Water Trailer Specifications and Water Trailer Emergency Response pages. Questions? Please give us a call at 772-646-0597 or contact us below and ask about our fire suppression water trailers.